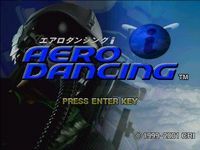 Aero Dancing i, the third game in the AeroWings series, was only released in Japan. The "i" stands for Internet, as it was the first title of the series with an online mode. It was also the first in the series to offer air-to-ground combat missions. AeroWings (Aero Dancing in Japan) is considered by its fans to be the first true attempt at combat flight simulation on consoles. Contrary to the arcade-oriented "Ace Combat" series, AeroWings provides fairly accurate flight physics, 3D cockpit views, refueling and real weapons loads. Taking off from and landing at airbases and carriers is also simulated. A replay video system is able to record your entire flight and allows you to create your own movie with more than 30 different cameras. Source: Wikipedia, "AeroWings (series)", available under the CC-BY-SA License.